Thank you to everyone who participated in this year’s Chilli Cook-off. Here is Billy Bob announcing the winners! It’s coming! June 6th 7:30 PM. Our AGM, Future Ministry Plan update, and more!! Save the date. For the past two Sunday’s, May 6th and 13th, we brought a need before our church community. In specific, we asked you to give to our Summer Outreach program. In the past, this program has been funded by the Canada Summer Jobs program, a grant given by our Federal Government to help hire students for the summer months. We would apply to this program each year and usually be awarded enough funding to hire two interns. These interns, would then, become a critical part of our Summer Outreach program, helping to staff and facilitate all of the various activities. This past year the Federal Government made some major changes in the application and approval process for this program. In short, we were required to attest to some things in the application form that presented a major moral dilemma for us. These things included us agreeing to support abortions, among other things. Because we could not attest to these issues, our application was denied, leaving us (and approximately 1500 other organizations across our country) without funding to hire our interns. We made our initial appeal for support to our New Life family on May 6th. Then after one week, we closed out our appeal with one final reminder. Our goal was to raise $8000. We are happy to report that your response far exceeded our expectations, putting us well above our goal. In the end, you gave a total of $14,150 towards our Summer Outreach Program. In addition, we applied for, and were awarded an extra $2000 from another program unrelated to the Federal Government grant, giving us a total of $16,150 to work with this summer. We thank you for responding so beautifully to this need. Your response has not only given us the necessary funding to reach out to our community kids this summer, it has also given us the flexibility to do certain things that would have been restricted in the Federal Government program that we worked with in the past. We are now in process of firming up our plans and putting out job postings for our summer intern positions. We ask that you would pray for our Summer Outreach. We are stepping out of our comfort zone, and reaching into places that we have not gone in years. Together, we believe that our Summer Outreach will bring much fruit into the Kingdom. There is a notable staffing change at New Life Church that we would like to share with you. Effective in September, 2018 Pastor Koen Beugelink will be shifting his duties at New Life Church to fifty percent (50%). This will allow him at that time to begin a half time role at Abbotsford Christian Secondary School as Director of Faith Formation. After 15 years of full time faithful service, Pastor Koen’s transition will be a significant adjustment for both he and us. We are grateful; however, that Pastor Koen will remain in leadership as a pastor at New Life Church, involved specifically in Switchlife (Youth) ministries. In the following months we will be deciding how to staff other areas of ministry in which Koen has been involved. Pastor Koen and his family remain passionate about the New Life community and will continue to be vital members of New Life Church. We are grateful for Koen’s tremendous ministry, and his desire to remain part of the New Life staff team. Together, we are confident that this change will be an exciting opportunity for Pastor Koen, a challenging new direction for New Life, and a fruitful development for the larger Christian community. Hello New Life – here it is!! Our second annual Chilli cook-off. This is part of our yearly ‘volunteer appreciation” celebration. 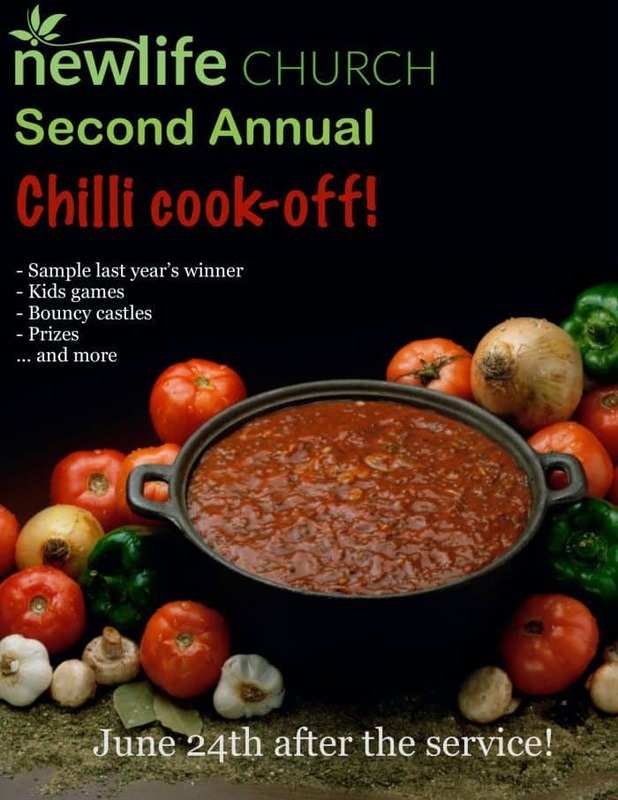 If you would like to enter the chilli contest, please go to the attached link, fill out the NLV form, and begin perfecting your recipe. 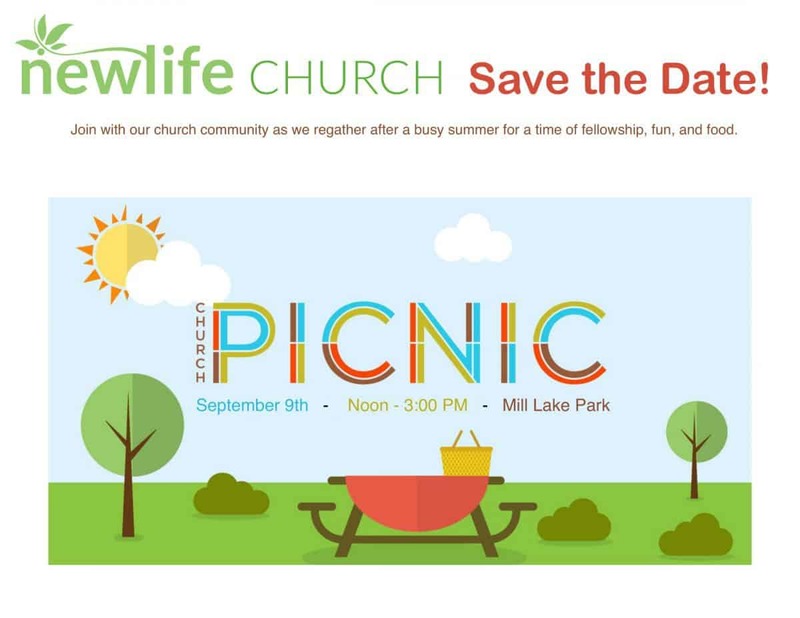 It’s going to be fun folks … save the date!! For the past many years, New Life has had the privilege of reaching out to our community each summer with a VBS kids program. You might recognize these outreaches by familiar names such as, “Mega Sports Camp,” or “Athletes In Action Summer Camp.” Over the years, the lives of hundreds of kids have been touched by these programs. We look forward to running these outreaches each summer, we believe strongly in them, and they are the focus of much of our creative energy throughout the year. One key factor in making this life changing week available to our community has been the Canada Summer Jobs program. This is a program run by our Canadian Federal Government that gives grants to organizations wishing to hire students over the summer months. These students typically work for New Life starting in June, and then continue their employment through the rest of the summer. For New Life, the hiring of summer interns has become a critical and timely component to our summer outreaches. As many of you might be aware, this past year, our Federal Government made some drastic changes to the approval process for the Canada Summer Jobs program. In short, they denied all applications that didn’t attest to supporting abortions – amongst several other important moral issues. New Life has made application this year but we have been denied approval for any summer student funding. We are not alone in being denied in this process. Over 1500 churches and religious organizations nationwide are in the same situation this year because of these changes. This summer, we have an amazing plan for an outreach within our city and in city parks. All of the pieces of the puzzle are coming together, we are excited, and we are already on our knees praying. However, we have been left without critical funding due to the circumstances explained above. Without our summer interns, it will be very difficult to move ahead with our plan. The Canada Summer Jobs program usually funds us to the amount of $10,000 which is enough for two summer students. The good news is, we have applied for an alternate grant and have been approved for $2000. This leaves us short approximately $8,000. We are putting this need in front the New Life family, knowing that God accomplishes His purposes through His people. This Sunday, May 6, we are asking you to prayerfully consider giving an extra, one-time gift above your regular giving towards our summer outreach. We are fully convinced that as a church, we are called to reach out to our city parks and streets in this way. We thank you in advance for your generosity. This coming Easter is Invite Sunday! We are praying for you as you consider inviting your friends and family members to New Life for the Easter Service on April 1st. We are hoping and praying that people who are looking for God, a connection with His people, or someone seeking help or support will be invited to New Life. Our hospitality reflects the hospitality of God who embraces all people with love and grace. Here are ten simple things we all can do to show hospitality on a Sunday Morning. 1) BE WILLING TO WALK Too often guests end up having to park in the back of the parking lot because the closer spots are long gone. Take the parking spaces near the back and leave the best parking spots for others. Don’t forget your umbrella. 2) LOOK FOR THE “LOST” LOOK If someone looks like they don’t know where to go, then they probably don’t. Step out of your comfort zone and ask if you can help. As an added challenge, don’t just tell them where to go, show them! 3) SHOW GUESTS AROUND If you are bringing a guest or see a guest help them find their way in the building. If they have children, help them through the check-in process and show them where the children go. 4) BRING YOUR SMILE A smile may be all a person needs to feel welcome. Guests feel more at ease when they see smiling people. 5) MOVE TO THE MIDDLE Move to the middle of your row so guest don’t have to walk over you. Trying to find a seat is part of what is awkward for newcomers – it’s hard enough to come in and just sit down! Your new spot will be terrific too. 6) MAKE THE FIRST MOVE Guests may be overwhelmed by the newness of their experience. Trying engaging them in conversation, ask them about their family, their occupation, and what they do for fun. 7) REMEMBER THEIR NAME Everyone likes to hear their name. Imagine visiting a church and on the second visit, someone you meet the week before calls you by your name? You would feel noticed, remembered and welcome! 9) THINK THREE Challenge yourself to talk only to those you don’t know for the first three minutes after the service – that is as long it takes for guests to leave after church. We want to let them know they are noticed and welcome! 10) INVITE THEM BACK When saying goodbye to a guest, it’s a simple thing to say, “Thank-you for being here. We’d love to have you come again!” Many people are looking for a place to belong. Let’s make New Life that place! The Board of Elders has been meeting over the past few months to develop a future ministry plan for New Life. It has been a busy time for the Board, but we would also testify to the blessing of coming together to pray, discern, discuss, plan and become excited about where God will lead New Life through this process. 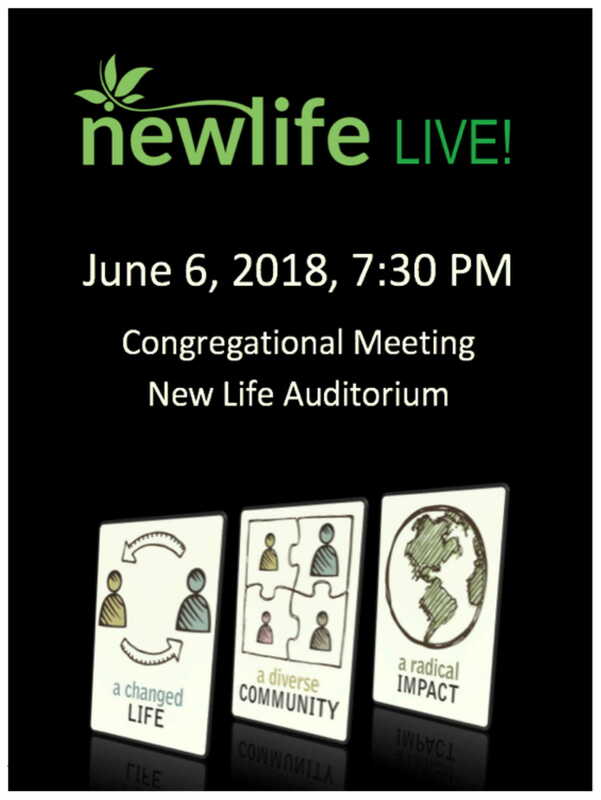 The congregation was invited to participate in focus groups that were held over three evenings in order to gather input around our three vision statements: A Changed Life, A Diverse Community, A Radical Impact. The board and staff have met numerous times to develop a draft plan. There is a sense that the board and staff want to continue forward movement but not to fast and compromise prayer, discernment and wisdom. Nathan O’Hare, one of the facilitators of the focus groups who works with Dave Blundell has helped to facilitate our planning meetings and guide our process. We aren’t finished yet. We’ve made great progress, but also have come to realize this is a big undertaking and want to do it well. We will have something to present at our June meeting. Our hope is that a draft of the plan will be complete, however if we find that our timeline is a challenge, we will continue to complete the finer details of the plan into the fall of 2018. Together as a congregation, board and staff we have invested in this planning process and we ask that you continue to pray for the board and staff as we formalize the plan.